Welcome to ep. 58 of The Shooting the Breeze Sailing Podcast, 2016 Annapolis Boat Show wrap up part 2, survey of vendors and Friends. It was a really good time hanging around the boat show this year! 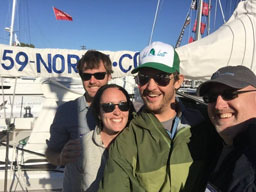 I was able to get some really great, fun, and informative vendor interviews and updates from our increasingly exciting circle of sailing friends. I blather on for about 15 minutes about my September sailing vacation week to Annapolis and back during the intro, and then we go on to the interviews. First up is David from Annapolis Hybrid Marine, Daneen from Mantus Anchors, the good folks at the Boat Loop, Jeff from The Sailing Academy, John Franta from Colligo Marine, Etienne from ATN Inc. as he explains his products to a cruising couple, Paul and Sheryl Shard from Distant Shores and their exciting news about a new boat and possible crew opportunities, and finally we catch up with Lee and Rachel Cumberland from Beautiful Crazy Happiness aboard Isbjorn working the 59-north.com beat telling the tale of taking their Tayana 37 to Panama and back over the past year, as well as a snippet from Lee’s band The Northern Outfit at the end.